Batman is alerted that the inmates of Arkham Asylum have taken over the premises. If this isn’t dangerous enough, they’re threatening to murder everyone in the facility unless Batman agrees to a face to face meeting. I understand that a lot of people can appreciate the style in which both Morrison and McKean approached Batman, however this just wasn’t for me. Maybe I like my stuff a little more.. focused? I have no idea if that’s the right word. I feel like I’m almost speaking a form of blasphemy here by not loving this book. 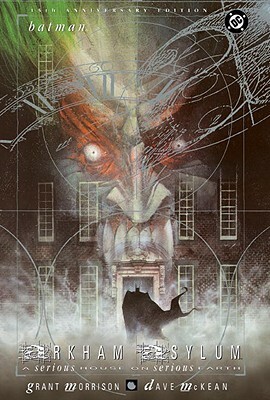 That being said, I certainly do not want to take anything away from Dave McKean – the guy is crazy talented. I just question whether or not this really works within the constraints of a comic book. I thought the scenes were unfocused and hard for me as a reader to follow. I guess when it came down to it, I had a lot of trouble grasping exactly what I was looking at. I’ll give McKean credit for trying something outside-the-box but I feel like the whole presentation was lost on me. Also, a lot of the dialogue contained some strange choices. In particular, Morrison having Batman scream, “Jesus!” felt weird and awkward to me. Before you jump down my throat, it wasn’t all bad. I’ll say that I liked the idea of giving each character their own specific font when they spoke. Joker’s sharp words cutting through the atmosphere gave his madness that extra intensity. Apparently, this is something that is considered an industry standard today but it all began with Gaspar Saladino’s superb lettering. I guess I appreciate what was attempted but I’m not sure I could bring myself to read it again or who exactly I’d recommend this to. May 24, 2013 in Comics, Fiction, Grant Morrison.